SEO rules change and if you don’t keep up with these changes you risk losing your hard earned page rank in search results. Changes made to search engines algorithms in 2013 have had a profound effect on SEO rules in 2014. These effects will extend into the foreseeable future. If you have a business or entertainment website you need to be aware of the new SEO rules and how they will affect you. In simple terms basic, on site SEO (Search Engine Optimization) is a relatively easy thing to do. The search engines have a “template” if you will of what an ideal web page/site should have and how it should be put together. The closer you come to matching this ideal the higher you should rank in search results for terms that are related to your site. In practice though SEO rules are not intuitive enough so that following them will “just happen” if you design a visually appealing website. Many web designers only do a visually appealing and functional site, they do not incorporate SEO rules into their design. If you have an existing website you should have an SEO analysis done on it. SEO rules require you to pay attention to every little detail when you produce content. We useWordPress as a platform on which to design websites because it is versatile enough to be easily edited to make sure it matches the ideal search engine template. In addition we endorse the Yoast SEO plugin for WordPress as an invaluable editing assistant when creating new content such as blog posts. The search engines themselves have evolved over time and continue to do so. Each of them has their own mathematical algorithm. These algorithms are not all identical. Google handles 80% of search queries on the web though and consequently it is Google that establishes the SEO rules that everyone follows as “best practices”. 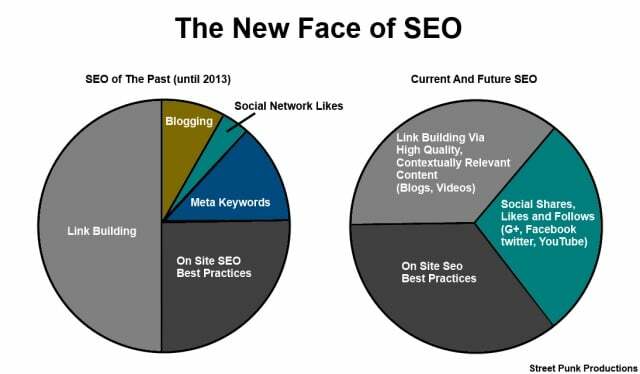 We created the pie charts above to illustrate the changes in SEO rules that have occurred over the last year or so and have really permanently altered the ball game in SEO. In the past it was fairly easy for Black Hat SEO companies to push undeserving sites to the first page of Google search results. They did this by creating thousands of backlinks to a site. The backlinks could be on any site, even just on pages they created themselves or on “backlink farms” that thrived on doing nothing more than hosting pages full of links to the websites of paying customers. Another way they used to game the SEO rules was by loading a page full of otherwise irrelevant content with every keyword they could think of that was related to a search for a particular product or service. Or they might take a single blog post, load it with keywords and then “spin” the article by randomly changing every third or fourth word in it (other than the keywords) and post 50 or 100 spun copies of the same blog post. The more times it was spun the less sense anyone could make out of what it was supposed to say. None of these techniques work anymore. Websites that used them are finding their search engine position dropping like a stone (some of them have come to us for help). A new era has come to the way search engines function, one that is intended to deliver the best, most relevant content to each query from a user. 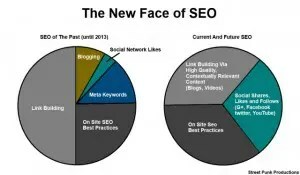 The new SEO rules are designed to focus on content. Good quality content that gives the best possible answers to people’s questions. I know that seems simple enough but computers cant make intuitive judgement choices…yet. Until they can they have to use things that they can measure, data, to make that determination. So SEO has become much more than just having a website that conforms to SEO rules and a bunch of backlinks. It has expanded to include input from social media networks and to making judgements on the quality of your site and your content by the quality of the sites that link back to you. “You are known by the company you keep” is as good a way to say it as any. You see, Google decided that the best place to look for reliable data on the value of a website, blog post or video is the audience. The theory is that, the more people who like and share something the more value that it must have to them. Likewise with backlinks. The more links that point to your site from other high quality sites which deal with the same topic the more value your content must have. 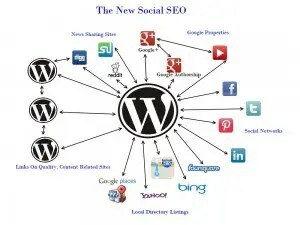 This is the birth of Social SEO and Contextual Search. Google has created a fun little animated illustration of how search works at this link. As a business owner or content creator it is good to check out that illustration. Once you realize how much goes into every search that happens on the web you cannot help but realize a; how much competition there really is for the top spots in search results and b; the necessity of making your site and your content as good as possible both from the perspective of viewers and the behind the scenes requirements of the SEO rules. In the illustration above (on this page) you see how many obvious factors there are in Social SEO that can affect the search engines perception of the quality of your site and your content. You may have great content and perfect on site SEO but any number of other sites may have content of equal quality and also have perfect on site SEO. That is the easiest scenario from which to start when understanding the value of Social Networks of various types to your page rank. It is also the perfect segue into the next part of what makes up following SEO rulestoday. If the competitors in the above scenario all have content of equal quality and perfect on site SEO how does the search engine decide on page rank? The page with the most links on other quality sites, social network likes and shares and traffic will have the number one spot in many cases. That is why it is as important or more important than ever to have a robust social networking presence in place. We talk to a lot of business owners and even people who handle digital marketing for mid size to large businesses and it is surprising how many of them never took the time to learn enough about SEO rules to realize that the websites they are responsible for are sorely lacking in that area. We hear things like “oh there was a module that came with our website that does SEO”, or “we’re covered for SEO” when we have already looked at their site and seen that they are not. The same thing goes for Social Networking and the creation of content. Social Networking is now a crucial part of SEO but too many people who manage social networks don’t see it that way so they miss opportunities. The same goes for content creation. Most people who upload videos to YouTube expect the quality of the video to get them views. But search engines don’t watch videos they depend on the content on your channel page and individual video pages to determine what your video is about and who to show it to in search results or as a suggested video. Once again SEO rules need to be followed when creating a channel page and every time you upload a video. Some other factors that can come to bear on page rank in the above example are things like proximity (how close are you to the person doing the search). Here is where having an SEO optimized local directory listing is crucial as a component in page rank and your overall digital marketing plan. Why SEO optimized? Because if your competitors have a better local listing then theirs will appear higher than yours in that set of results and may push you off of page one. Let’s refer back to the Google depiction of the search process that I linked to above. It is important to think about the different parts of the search process and which ones can be influenced by what you do on your site(s). Our intent is to show that relatively simple SEO ruleshave expanded to include pretty much everything you do on the web and how to show how important it is to realize that. Crawling: This is the initial phase of the search process. The Google Web Spider goes out into the 60 trillion (and growing daily) pages on the web and tries to index them. This is the first place where on site SEO is important. By following the SEO rules for best practices on site you show the spider that your site is of good quality and allow it to easily determine what each page is about. This is also where many people think SEO stops. This is far from being the case. Both Google and Bing have Webmaster Tools to assist in managing your site and they too can be employed at this stage. Programs And Formulas: This is the second stage of search and the one where the search algorithms you hear so much about come into play. The tools that Google uses as examples for this stage of search are; spelling, autocomplete, synonyms, Google Instant, query understanding and search methods. You have control over some of these factors as well. You can make sure the content on your page is correct grammatically and everyone has a spell checker so there is no real excuse for bad spelling. You can establish a unique keyword or keyword phrase for each page to be built around. This does not mean meta keywords. We don’t use meta keywords at all anymore with the exception of on YouTube. It means you know what keyword or phrase best expresses what the page is about and then you put that keyword (ideally) in the page URL, the title, the meta title, the meta description and in the body of the page. You use it at a rate of around 2% of the total words on the page and include some synonyms as well. If you look at this page you will see that we have followed all of the above SEO rules when writing this story. In addition, you have to be sure that your site is readily accessible on multiple platforms (PC, Mobile, Tablet). The more ephemeral aspect at this stage is query understanding. The search engines are trying to understand the context of the query in better ways and you have to keep in mind how a person would ask questions related to your content and design it to answer the question the way it would be asked most often. Ranking The Results: Google says that they consider over two hundred factors when deciding how each page given in answer to a query ranks in search results. Two hundred factors. That is quite a daunting number when you are trying to create content that will rank highly isn’t it? But it validates our earlier statement that everything you do matters when it comes to followingSEO rules. The ranking factors that Google lists are; page and site quality, safe search, freshness, user context, translation and universal search. Obviously you have control over whether or not your site is family safe (or not). Page site and quality are influenced by following on site SEO rulesand here is also where back links and social likes and shares come into play as well as the traffic to your site. Freshness is important because it illustrates the importance of creating content on an ongoing basis. User context adds in factors like the physical location of the person making the query in relation to your location if relevant. 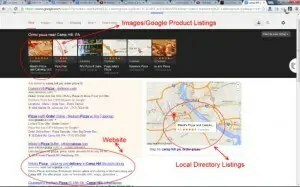 This is where Local Directory Listings come into play, especially for local businesses and can definitely have a big influence on your ranking in search results for local users and why they are so important. Universal Search means that the most relevant results to a query from multiple sources are displayed on the search results page. Some of these sources include; images, website, social networks, local directory listings and video. If you have material relevant to the query available in all of these sources then you could conceivably dominate the entire first page of google results for that query. 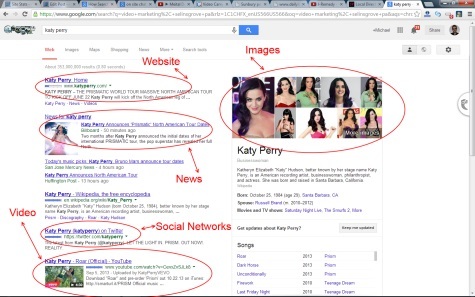 The image at the left shows the results of the simple query: “Katy Perry”. As you can see Universal Search has considered material from various sources and is displaying the most relevant results from each on the page. The result is that the performer Katy Perry dominates the entire first page of google results from the web, images, video, social networks and even news. The advantage of this is obvious if you have competitors. How does this work for a business. The most frequent queries will probably not contain your business name but rather the name of the product or service that you offer. If you utilize all available types of media and some 3rd party services like local directories there is a chance you can achieve at least several first page placements on page one of Google and perhaps even dominate the entire page. But you have to follow SEO rules throughout to maximize the potential of this happening. The image to the right is the result of searching the term “Camp Hill PA, order pizza”. That is a pretty general search about a product in a specific location. One of the businesses that we have done some SEO work for, Nikoli’s Pizza comes up as the first Google Product listing at the top of the page (with image) and the first result on page one of this search. There are a lot of pizza places in the Camp Hill/Mechanicsburg/Harrisburg Pa area. Big chains like Dominos, Papa John’s, Pizza Hut and Little Ceasers are all over the market area as are a host of other independent pizza places and Italian restaurants. In spite of this a small, family run operation like Nikoli’s comes up as number one (and in three different listing types) in their area on a Google search done by someone who wants to order pizza! I think that is awesome. Google Specific: In the last year Google has done a lot of things to integrate many of their products with each other. To do this they used Google+ as the glue that holds it all together. Now, local business listings in Google Places are by default done as Google+ business pages. You can also get a vanity URL for your Google+ business page (Example: plus.google.com/+streetpunkproductions). 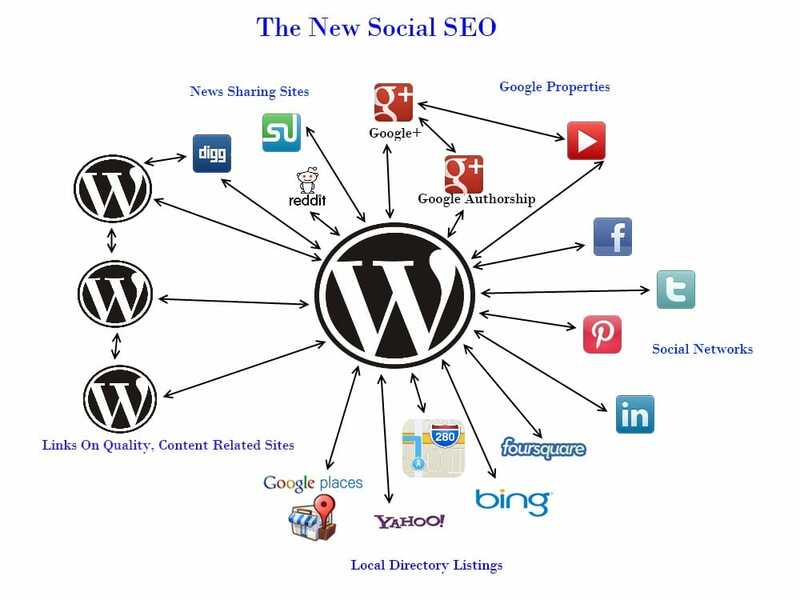 This helps with your efforts to bring your social network pages into line with SEO rules. Another exciting feature is Google Authorship which is also tied to the content author’s Google+ profile. In addition, the comments on YouTube are also now powered by Google+. The advantages are that, as long as you have a Google+ profile, your content will be more likely to appear on the first page of Google results to those people in your Google+ circles. The incentive to have your customers/fans as part of your Google+ circles is obvious. Everything discussed above is part of the new SEO rules for 2014 and beyond. To truly optimize the potential of your web assets you have to be aware of all of it every time you create a blog post or upload a video. You have to think about the URL, title, description and text content of the post. In addition you have to consider adding images and making sure to alt tag the images with your focus keyword or keyword phrase for the page. You should also research the topic on your page and try to incorporate the most popular keywords that are related to the topic. You can also add a video to the post and create a video for the purpose. Then optimize the video’s page on YouTube in the same way as you do the blog post itself. Once you create your content according to SEO rules and publish the video and the post (with Google+ and Authorship enabled) it is time to further promote it via your SEO rules optimized social networks. The next step is to go to the webmasters tools sites and have Google and Bing spider your site and add your new page to their index. This can really speed up the process of being available to search engines.You would post links to Facebook, Google+, Twitter, Linkedin, Pinterest etc. to reach your established fans/clients. Then also post to some news distribution services like Digg, Reddit and StumbleUpon. This will create backlinks as well as putting your content in front of people who can further your SEO efforts by liking, sharing and linking to your content. LOL Glad you like it. I have done absolutely nothing to the base theme what so ever.